The nail knot is a very significant fishing knot that is widely used to connect the fly line to the leader. It is good for joining two lines of different diameters allowing you to attach backing to the fly line and the fly line to the leader, or the tippet. The knot derives its name from the use of a nail that originally acted as a guide for making the knot. However, replacing the nail or a needle with a thin hollow tube or straw, as described below makes the tying easier. In the following instructions for tying the knot, the thinner red rope depicts the leader that needs to be attached to the thicker blue fly line. You can use a nail knot tool or device to tie a number of nail knots fast. If you want, you can make a nailless nail knot by hand without using any tool whatsoever. Double nail knot – Instead if a single one, two standard nail knots are formed at the end of each line. To make the nail loop knot that is strongest yet slimmest way to make a loop at the end of a fly line. Can be used on a hook or swivel just like the improved clinch knot. For attaching a monofilament/braided fishing line to lead core leader material by carp anglers. Splicing a mono leader into a hollow braid. Double Uni knot – Effective for joining two lines having similar or varying strengths. Loop to loop – An efficient and quick connection for fly lines that come with welded loops at their ends. Braided loops also work well with this. Albright knot – Gives a less smooth finish. Blood knot – Good for joining two lines having nearly equal diameters. 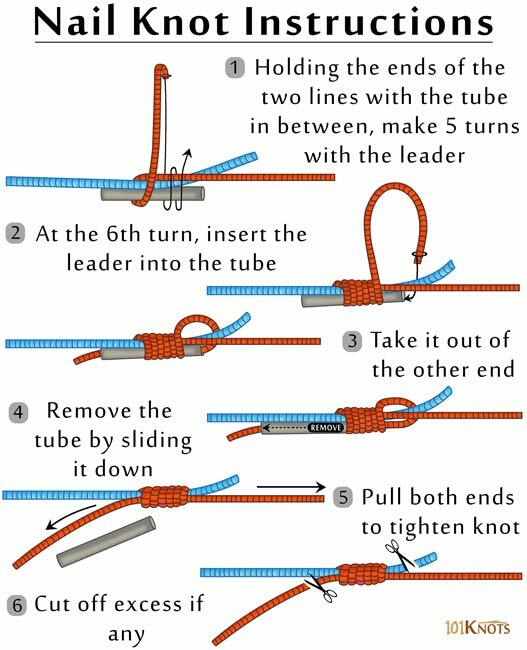 Surgeon’s knot – Used to join leader to tippet, it is bulkier but easier to tie. This knot can also be used to string up climbing rope through an established pulley, where perhaps a much smaller cord holds the place of the climbing rope while not in use. the same can be said for the opposite action, where one replaces the climbing rope with a stand-in to make set up much easier.